Mohamed Waheed Deen was the Managing Director of Bandos Island resort, one of the prominent resorts in Maldives, when President Mohamed Waheed offered to be the Vice President. Mohamed Waheed Deen undertook the responsibilities of the Vice President of the Maldives from the 25th of April 2012 following the transfer of power to the current Government. Mr Deen being politically neutral with no political party affiliations believed that it was time to serve the nation, and thus humbly accepted the challenging status of Vice President, where His Excellency Mr Deen has been exposed to different aspects of the administrative challenges that are faced by the current government. With a common view of bettering the lives of each Maldivian, Mohamed Waheed Deen committed himself along with President Waheed to help and support the government find solutions to the problems facing our nation. Mohamed Waheed Deen has been involved in the tourism industry for over forty years and has held various positions in government previously, such as Minister of Atolls Administration, Minister of Youth and Sports and as a member of the Human Rights Commission of Maldives, where Mr Deen was one of five members of the first Human Rights Commission from December 2003 to July 2005. Mr Deen served as the Minister of Atolls Development from July 2005 to June 2007 and Minister of Youth and Sports from June 2007 to August 2008. Before accepting the post of Vice President, Mohamed Waheed Deen worked on the Maldives Tourism Advisory Board, Maldives Tourism Promotion Board, Maldives Airports Company and the Sports Tourism Committee as executive member. 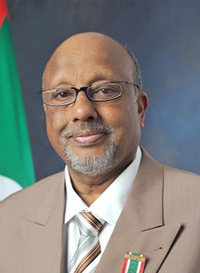 As the Vice President, His Excellency Mr Deen currently chairs the National Drug Control Council, Crime Reduction Coordination Committee, Climate Change Advisory Council, Committee for Coordination between Government, Civil Service Commission, Addu Development Committee, and the Qawmee Food and Nutrition Council. He is also part of the Crime Prevention Taskforce and the National Security Council. For his work for the country, Mr Deen was awarded the Certificate of Commemoration for national service in recognition of service rendered to the nation during the terrorist attack on November 3rd 1988. He was also presented the National Award in recognition of his service to the tourism industry in 1993 and community development in 1997, and a National Award of Honor in recognition of service to the social contribution to society in 2010. An Honorary Award was also presented by the Ministry of Tourism in recognition of the distinguished service rendered towards the sustainable development of tourism in the Maldives for 25 years. Mr Deen’s passion being the fields of tourism, sports and the promotion of people’s happy and quality lifestyle, he has helped many people in need and served in various positions both in the country and internationally. In this regard, he has served as the Executive Vice President of the Asian Bodybuilding Federation (ABBF), Chairman & Founder Member of the Diabetes Society of Maldives (a charity organization), Vice President of the Maldives National Chamber of Commerce and Industry, Executive Board Member of the Maldives Association of Tourism Industry, Founder & Chairman of the Body Building Federation of Maldives, President & Founder Member of the Maldives Surfing Association, and as a Trustee of Live & Learn Environmental Education. With the experience gained working within the diverse sectors, Mr Deen feels that the basic fundamental need for Maldivians is education. Thus he has paved way to educate, strengthen and economically empower Maldivians and this passion has led him to be the Founder of the Institute of Governance and Development (IGD) at Bandos Island Resort. The IGD is the only institute that conducts awareness programs for atoll and island councilors and is the only institution that conducts Maldives Qualifications Authority-approved training courses to educate councilors. Additionally, IGD conducts the Youth Leadership Program that started with a nation-wide youth parliament, which is an ongoing educational opportunity for the amazingly dynamic Maldivian youth. Although a small archipelago and a democracy in its infancy, Mr Deen’s perception is that Maldivians believe that individual honesty and the pursuit of excellence in all endeavors are at the heart of success. Mr Deen believes that the future is our collective responsibility, that now is the time to emphasize and uphold the rights of all the people in this small but great nation, and to pave the path for economic empowerment of the people. His Excellency Deen feels that therefore an economic reform program introducing taxation in a staggered manner, so as to not overwhelm the businesses or individuals with new taxation policy would be an effective way of dealing with the wealth disparity in the Maldives. He also feels that a key feature of the economic reform agenda should be to educate and create awareness among the population regarding the benefits of taxation to the communities and individuals themselves, thereby dispelling the negative connotations previously associated with taxation. Mr Deen believes that economically empowering people is essential both to realize people’s rights and to achieve broader development goals such as economic growth, poverty reduction, better health and education and welfare. He emphasizes that now is the time to work together irrespective of political affiliations, towards a common goal of creating a financially viable and sustainable economy and a sense of community for the future generations. Therefore, Mr Deen believes that, as a Government, we should work for democracy, peace, prosperity, stability and freedom by encouraging the pursuit of knowledge, respect for life and social justice in all Maldivians. Mr Deen is the people’s man who always stands up to serve the nation and its people. Vice President Mohamed Waheed Deen always wishes all Maldivians to have peace, stability, democracy and success through economic empowerment.